Spectroscopy is the measurement of interactions between electromagnetic radiation and matter. Electromagnetic radiation, which includes light, has characteristics of waves and particles. Each "particle" of light, or " photon ," has a discrete amount of energy that can be transferred to a molecule. The transverse waves of electromagnetic radiation possess a constantly changing magnitude of electric and magnetic fields in directions that are perpendicular to the direction in which the wave is traveling. These changes in the electric and magnetic fields can cause changes in molecules. Electromagnetic radiation can be transmitted, absorbed, or reflected by matter, and each region of the spectrum can be used to investigate different aspects of the structure and properties of molecules, depending on the amount of energy imparted to the molecule. The absorption of radiation by matter is a quantized process, in that a molecule will only absorb radiation of certain discrete frequencies. These frequencies are determined by well-defined spacings of energy levels in the molecule under investigation. The absorption of photons of high energy cause large changes (often irreversible) in the molecules and correlate to moving electrons to higher energies. 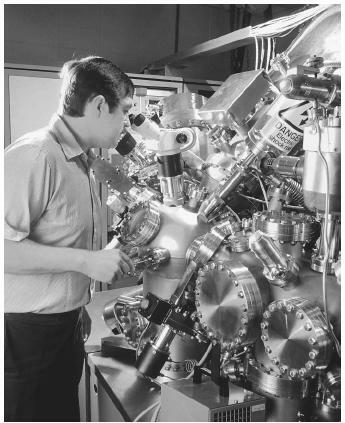 Electron spectroscopy is used for measuring concentrations, rates of absorption, and molecular structure. absorbance of a sample is proportional to the length of the sample that is in the path of the probe radiation and the number of the molecules in the beam path. A plot of the absorbance or transmittance versus the wavelength of radiation is called a spectrum. When molecules absorb photons in the ultraviolet and visible regions of the spectrum—corresponding to waves with wavelengths between 190 and 1,100 nanometers (7.48 × 10 −6 and 4.33 × 10 −5 inches)—electrons are promoted to higher electronic energy levels. Since molecules absorb photons with energies that match the difference in energy between their electronic energy levels, only a portion of white light is absorbed by a given molecule, giving it color. The color of light absorbed by a molecule is subtracted from white light, and the remaining light will be the complement of the light absorbed. Ultraviolet-visible spectra show the relative spacing of energy levels in molecules. Generally, molecular energy levels are stabilized when a molecule possesses alternating double bonds and the energy of the photons that these molecules absorbed shifts to lower wavelengths. This phenomenon explains the observation that ethylene, possessing one C=C bond, absorbs light of 180 nanometers (7.09 × 10 −6 inches) and is colorless, while beta-carotene, possessing eleven alternating C=C bonds, absorbs at 450 nanometers (1.77 × 10 −5 inches) and appears orange in color. Light absorbance in the ultraviolet and visible regions is used to determine the concentration of molecules in solution and of atoms in the gas phase . Chemists can determine the concentration of lead in drinking water with absorption spectroscopy. Radio waves can be used to probe the electronic environment of the nuclei of atoms. The nuclei of atoms spin in a clockwise or counterclockwise fashion and create a magnetic field. This field can have the same or opposite field as a superconducting magnet surrounding the sample. When radio waves of a particular frequency are applied to the sample, the spin of these nuclei will change. The frequency of radiation absorbed by molecules in a magnetic field is determined by the types of bonds and the way these bonds are connected. Chemists measure the absorption of radio waves by molecules using a technique called nuclear magnetic resonance spectroscopy. This type of spectroscopy can also be used to determine areas of the body that are diseased, through a technique called magnetic resonance imaging. Microwaves with long wavelengths cause molecules to rotate faster when they are absorbed. Polar bonds in molecules like water and sugar act as handles for the microwave radiation to grab on to, and the rotational energy can be greatly increased by short exposures to microwaves. This fact explains why polar molecules heat up quickly in microwave ovens. By measuring the wavelength of absorption through microwave spectroscopy, researchers can determine the size of the molecule. The absorption of infrared radiation (1 to 1,000 micrometers, or 0.0000394 to 0.0394 inches) causes bonds in molecules to vibrate. A bond in the molecule must undergo a change in the dipole moment when the infrared radiation is absorbed. The stiffer the bond, the more energy is required to cause the bond to stretch. Therefore the frequency required to cause C–N, C=N, and C≡N bonds to stretch increases from left to right. Often the infrared spectrum is considered to be a fingerprint of the molecule. Matching a sample's spectrum with a standard spectrum can positively identify the sample. This technique is used to measure emissions in automobile exhaust. Fluorescence is the process by which molecules emit light. When an electron moves to a level of lower energy, light can be given off with a frequency that matches the spacing between the original and final levels. The electron must initially be placed in a higher energy level by the absorption of light at short wavelengths. In fluorescence, the molecule loses some of this excess energy by emitting light at longer wavelengths instantaneously. This process is observed in sodium streetlights, where sodium atoms in the gas phase have been excited by an applied voltage and the electrons relax to lower energy levels and give off yellow light at 589 nanometers (2.32 × 10 −5 inches). Fluorescent dye molecules on clothing are excited by ultraviolet light, and these molecules give off energy of longer wavelengths, as electrons in the molecules relax to lower energy levels. The fluorescence of molecules is very sensitive to the polarity, temperature, and viscosity that the molecule resides in. Unlike absorbance, fluorescence is not measured on a background and can quantitate very low amounts of materials. Richard Mathies and coworkers have detected single molecules in solution by fluorescence spectroscopy. X rays and gamma rays have enough energy to remove electrons from atoms and molecules and thereby ionize them. The wavelengths of x rays that are absorbed are determined by the distance that an electron is from the nucleus. Furthermore, the regular spacing of atoms in a molecule can create a diffraction pattern of x rays. By examining the diffraction pattern, researchers can accurately determine the arrangement of atoms in a molecule. Many scientists use spectroscopy on a daily basis to gain insight into the structure of molecules or the concentration of atoms or molecules in a sample. The chemist uses radio waves and infrared radiation to determine the structure of a new molecule. The geologist uses ultraviolet radiation to determine the concentration of a particular element in a rock or mineral. The microbiologist uses fluorescence measurements to determine the concentration of bacteria in solution. SEE ALSO Rydberg, Johannes . Harris, Daniel C. (1999). Quantitative Chemical Analysis, 5th edition. New York: W. H. Freeman. Ingle, James D., Jr., and Crouch, Stanley R. (1988). Spectrochemical Analysis. Englewood Cliffs, NJ: Prentice Hall. Peck, K.; Stryer, L.; Glazer, A. N.; and Mathies, R. A. (1989). Proceedings of the National Academy of Sciences of the United States of America 86: 4,087–4,091. Skoog, Douglas A.; Holler, F. James; and Nieman, Timothy A. (1998). Principles of Instrumental Analysis, 5th edition. New York: Brooks/Cole. We all know that this (Spectroscopy) is the best topic in chemistry. I feel very happy to read about it here. This covered whole points about it. Every details about it given by very simply and knowledgable language.